Peak Land Services has taken over 1800 oil and gas leases in the Permian Basin since 2014, and completed even more open acreage reports and ownership reports. We have crews active in the Central Platform, Delaware Basin, and Midland Basin. We also completed a year long ROW and gathering system project which will connect multiple fields for various operators in the region. We have worked for both publicly traded companies and small, equity-backed management teams. Being local to where the work is becomes a cost and time advantage over other industry peers. 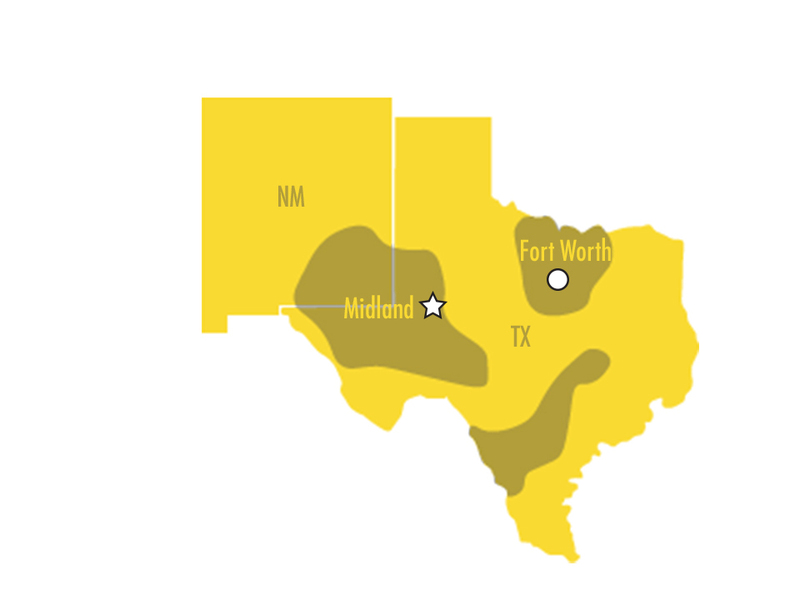 Peak Land is strategically headquartered in Midland, Texas. Many of our contractors live in the West Texas Permian Basin area which cuts down on lodging and mileage costs for our clients. Having so many local landmen also means that our clients get more work in a given week from our group when compared to others, increasing the overall project efficiency. We know most of the oil and gas attorneys in the Midland Basin and Delaware Basin and have strong relationships with them. We have a great team in Midland and continue to grow our client base even with low oil prices. Being one of the few mid-sized land service companies based in the Permian Basin is something we are very proud of. Give us a call; we know what it takes to get results in the Permian. Peak Land’s Fort Worth office handles all of our Eastern Shelf, North Texas, and East Texas activity. We have done multiple due diligence and add-on acreage lease plays for small to mid-sized operators in the aforementioned areas. Our Fort Worth office also helps handle projects in which we have patent to present online records and is extremely efficient in conducting remote title requests for our other crews. By providing multiple subscriptions and access to Drilling Info, Drilling Info Courthouse, and various online records for our contractors, we are able to cut costs and increase efficiency for our clients. While nothing can substitute for indexing in the courthouse, we have found that these tools are viable supplements to traditional courthouse work when providing a quality product.